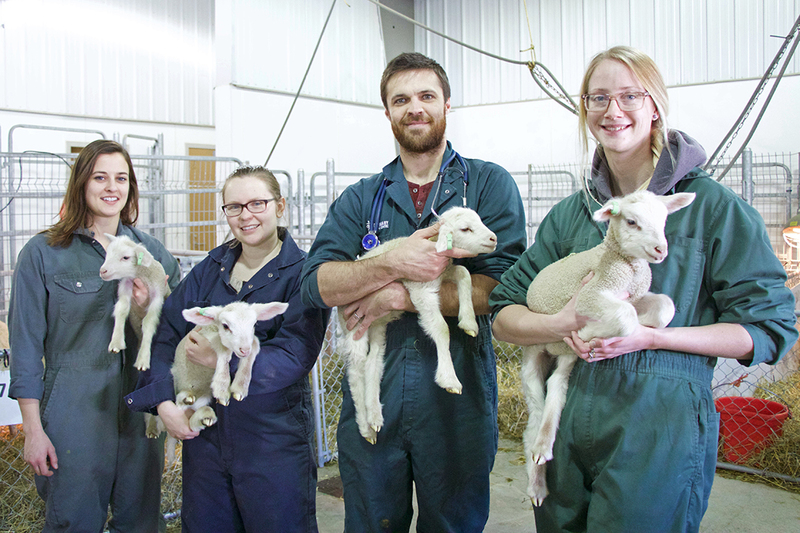 From left, Josée Grégoire, Jillian Russnak, Rob Stevens and Sam Deamel were part of the first neonatal rotation offered to fourth-year students at the WCVM. Photos by Taryn Riemer. Fourth-year veterinary students at the Western College of Veterinary Medicine (WCVM) have many different options when choosing their clinical rotations, and with each rotation, they gain valuable hands-on experience. But WCVM reproduction specialists Drs. Colin Palmer and Dinesh Dadarwal thought something was missing from the list: a neonatal rotation focusing on ruminants. While senior students have a good chance of gaining first-hand experience with calving and lambing in other clinical and external rotations, this new rotation provides more specific knowledge on ruminant reproduction. Palmer and Dadarwal’s goal for this rotation was to give students first-hand experience with lambing and calving. During the rotation, students monitored mothers and newborns and gained an understanding and appreciation for behavioural and physiological changes that occur in the mothers before and after they give birth. They also gained experience with technical procedures that occur during and after calving and lambing. Palmer and Dadarwal began preparations for the students’ new learning experience nearly a year ago. For its first year, the rotation included eight Canadian Rideau Arcott-cross ewes and three Holstein heifers that were bred to give birth during the first two weeks in February. The ewes gave birth to a total of 13 lambs and the heifers each had one heifer calf. Fourth-year student Josée Grégoire, from Winnipeg, Man., was one of four students in this year’s ruminant neonatal rotation. Since this was the rotation’s first offering, the instructors wanted to get a lot of input from the students. Grégoire also enjoyed the practicality of the rotation: “Having a good understanding of maternal and neonatal care in the lambing and calving process is very helpful for our future careers in this field. Now that the rotation has wrapped up, Palmer said the heifers and calves will be sold as pairs. The ewes will stay onsite for next year’s rotation and some of the lambs will be sold once they are weaned, while others will stay on site and become replacement ewes. Next year, Palmer and Dadarwal will offer this rotation again — but times two. While the plan is to continue working with pregnant sheep and cows for 2019, Palmer eventually hopes to expand the neonatal rotation so it includes other species. Along with Palmer and Dadarwal, several others worked to make the ruminant neonatal rotation a success. Dr. Fabienne Uehlinger, Dr. Chris Clark and the team at the Animal Care Unit all had a hand in the rotation. Drs. Dinesh Dadarwal, left, and Colin Palmer, right, were part of the team behind the new neonatal rotation. Article re-posted on 2-Apr-2019 5:07:28 PM .